The Maryland General Assembly is right now considering a statewide ban of styrofoam food service products (SB0285/HB0109). I am very pleased to see this. Montgomery County banned styrofoam food service products in 2015 by passing legislation I authored, joining a regional effort with Washington, DC and Prince George’s County. 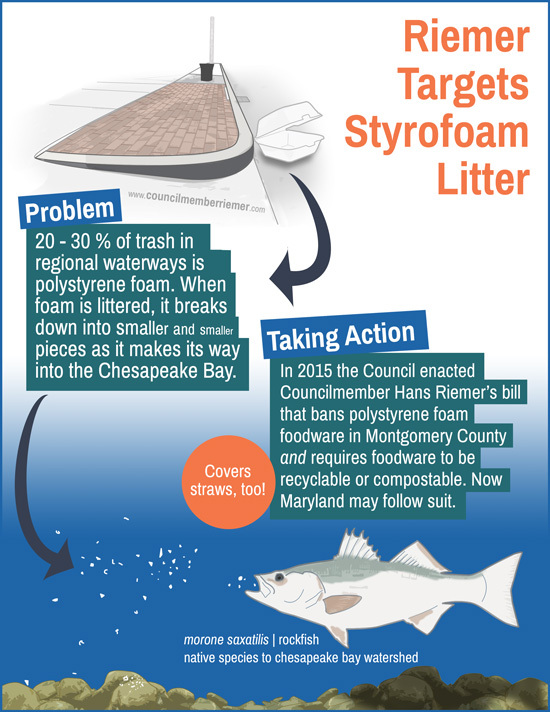 What makes styrofoam a particularly pernicious form of litter is that the petroleum-based plastic breaks down into small pieces as it makes it way to the Chesapeake Bay, but it does not completely dissolve. This makes it incredibly difficult and costly to clean up. It also ends up in the food supply, as fish and oysters eat the bits of foam. The only meaningful way reduce this scourge on our watersheds is to ban it. Hopefully, the rest of Maryland will soon join us. Tuesday evening is the Public Hearing on a zoning change (ZTA 19-01) that I have introduced to make it easier to build Accessory Dwelling Units (ADU), such as backyard cottages (aka “tiny houses”), basement apartments, and garage conversions. These units have always been allowed in theory, but until 2012 they required an onerous and expensive approval process. In 2012 the Council tried to streamline that process, but added new restrictions that we have seen make it impossible to add an ADU on many properties. For example, only property owners with one acre can add a backyard cottage. The result has been that production of ADUs has barely risen, and there are only 468 legal ADUs in a County of more than 1 million residents. Montgomery County is facing a housing shortage and an affordability crunch. The two are tied together as the cost of housing is the primary driver of a community’s affordability. As we look to the future, I believe we must think differently and find new and creative approaches to the problem. ADUs are an important housing solution. They can provide housing for different generations of a family to live together but with a measured independence. As we have heard from many residents, ADUs can enable grandparents to live near their children; or adult children, including those with special needs, to live near their parents. ADUs can also provide an additional income for the property owner, improving affordability for retirees or young families. Because the units are generally small, they can provide affordable rental units in areas that have become prohibitively expensive. And because ADUs are dispersed, they provide desperately needed additional housing supply without the concentrated impacts on schools, traffic, and the environment that large new housing developments might have. Specifically, an ADU is a seperate dwelling unit that is on the same lot as a single family home. It has its own entrance, full kitchen, and bathroom. Providing an ADU is different from renting a room in a house. The tenant in an ADU does not have access to the rest of the home. While the proposal removes many restrictions, there are nevertheless a wide array of protections that remain. For example, the units could not be used for short-term rentals (i.e., Airbnb) and the total combined structure cannot be bigger than what the code already allows for a single family house. An ADU can only be rented, it cannot be subdivided and sold as two units. The property must be owner occupied. There are more. You can watch the 7:30pm hearing on livestream here, and the Council will accept written comments up until the final vote. In the weeks after the Public Hearing, the Council’s Planning Committee, which I chair, will hold worksessions to consider amendments and send a recommendation to the full Council. As you know, I have worked with my colleagues to create a Commission on Remembrance and Reconciliation about our history of racial injustice and directions for the future. As part of my learning about our history, I joined local historian Anthony Cohen at an event in Poolesville as he spoke about the long-overlooked story of the 1880 lynching of George Peck, a local laborer accused of assaulting a young white girl. Here is a video about the presentation where Tony examined the details of Peck’s arrest, abduction and murder. Correction: This post has been corrected to show that the County has 468 legal ADUs. A previous version had the number at 133. The National Weather Service is forecasting an overnight accumulation of 4-6 inches of snow for Montgomery County. Crews have already begun pretreating roads with salt or a salt brine mixture and will begin plowing once 3 inches have fallen. They will begin plowing emergency routes and primary and arterial roads first and then move on to residential roads (the State will separately do state highways). Please be patient; but also please make us aware of a gap in service. Visit the Montgomery County Snow Portal to learn more, to check the snow removal status of your street, and to file a snow service request with the County or State. 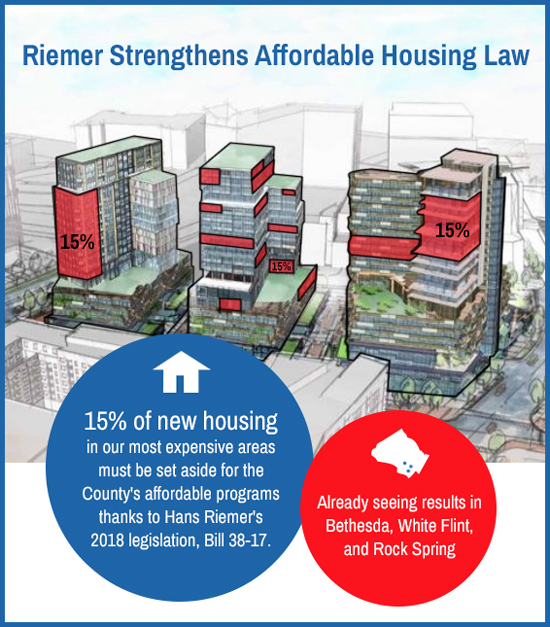 Housing affordability is one of our County’s greatest challenges. We have a housing shortage, which drives up sale and rental prices and creates affordability problems particularly for those with moderate or low incomes. Bethesda, White Flint, and Rock Spring. Read the Council staff report and news coverage of the legislation. The Council met on Tuesday, and you can see our agenda here. We began reviewing a plan to improve the areas around the Boyds and Germantown MARC rail stations. For me this week, a big theme has been walkability and pedestrian safety. You’ve seen the wrenching news about pedestrian crashes. Just last Wednesday, five pedestrians were struck in a single day. To get the County sufficiently focused on this problem, the Council passed a Vision Zero resolution in February 2016 (3 years ago) that committed the County to achieving zero fatalities on our roadways. The Leggett Administration followed up by presenting a two-year action plan and announced the intention of developing a separate 10-year action plan. We seemed to have momentum at that time. Of the 41 action items in the two-year action plan, 20 are behind schedule or not yet started. The new County Executive has recommended cutting funding in the Capital budget that helps us meet our Vision Zero goals, including funding for Bicycle Pedestrian Priority Areas (BiPPA), a program I have championed which allows us to make fast improvements in the highest need areas of the County. Not all of the news is bad. Last fall, the State Highway Administration (SHA) engaged with the Council and announced some changes that it plans to make that prioritize safety, and expressed openness to a new approach. It is a start. The Council too has a important role to play in making sure we reduce serious and fatal collisions on our roadways. We are now reviewing the Veirs Mill Corridor Plan, which is a great Vision Zero plan and focuses on changes needed to promote safety in that area. Read recent coverage of that plan here. We need to make safety a higher priority in our infrastructure, which is why I advocated–and my colleagues agreed–to restore funding to those BiPPA programs as well as for the pedestrian entrances to our Metro stations (White Flint and Forest Glen) at the Transportation Committee this week. My colleagues also supported my request to accerelate planning and design for BRT on Veirs Mill Rd. We have a long way to go before we will know what we can afford in our capital budget. But the Committee’s actions are a great and necessary step forward. We also need to get back to our Vision Zero plan. The Transportation Committee will soon review the County’s progress on implementing the plan–a special thanks to Chair of the Committee, Councilmember Tom Hucker, for agreeing to a worksession. The Council approved a resolution I authored that would allow the County to waive fares for federal employees and contractors to use RideOn during a future government shutdown. This will enable the County to act more quickly next time. Following up on an initiative that I organized last year with our farmer and maker communities to expand farm breweries, wineries, and cideries, the Council approved a zoning change that allows these businesses in 25 acre lot size, rural residential zones. Two young brothers want to open one in Olney, which would be the 4th brewery in that part of the County (Brookeville Beer Farm, Waredaca, and Elder Pine).